In one of the most powerful moments of the conference, migrant domestic workers and Afro-descendent domestic workers shared their strategies during a panel on racial equality and, in the process, "restored dignity back to themselves and to the work they do," says Adriana Paz, IDWF Latin America regional coordinator. 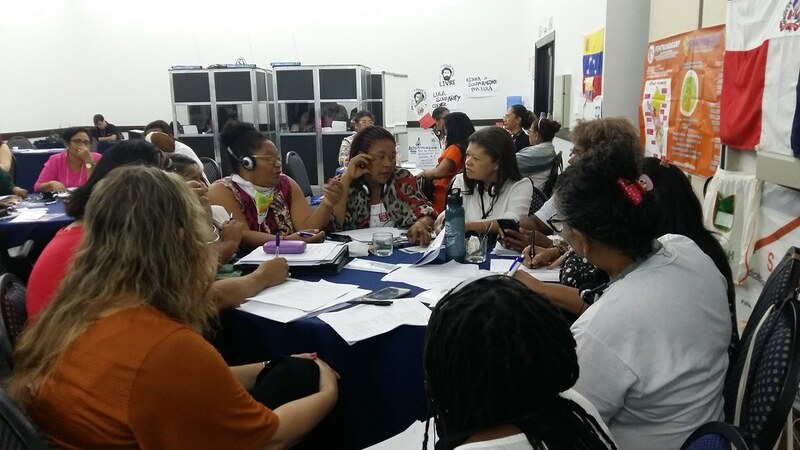 Some 40 domestic workers from 17 countries across North and South America and the Caribbean shared organizing tactics, hammered out resolutions and participated in Solidarity Center training on gender-based violence at work at a recent conference in São Paulo, Brazil. The conference is one of a series of regional planning meetings domestic workers around the world are holding in advance of the International Domestic Workers Federation (IDWF) congress November 16–18 in South Africa. Domestic workers from all regions will bring recommendations to the IDWF Congress. 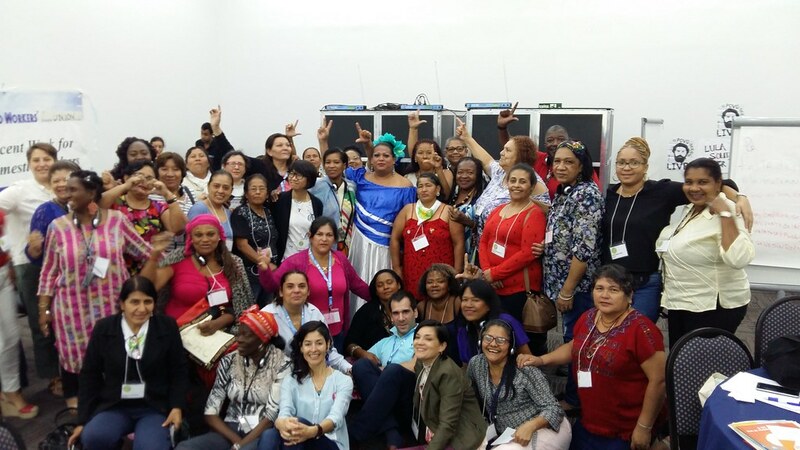 Latin American domestic workers voted to recommend the IDWF adopt resolutions involving safety and health, strengthening leadership of Afro-descendent domestic workers where they are a majority and supporting LGBT domestic workers who face double discrimination on the job. 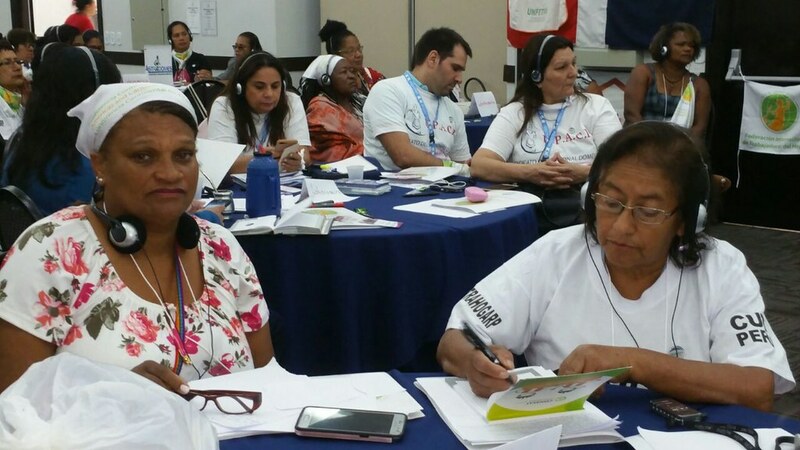 Delegates also nominated new leadership for the region, Andrea Morales from Nicaragua and Carmen Britez of Argentina, both former domestic workers. In one of the most powerful moments of the conference, migrant domestic workers and Afro-descendent domestic workers shared their strategies during a panel on racial equality and, in the process, “restored dignity back to themselves and to the work they do,” says Adriana Paz, IDWF Latin America regional coordinator. In Brazil, 70 percent of domestic workers are Afro-descendent as are a majority of domestic workers in Colombia, who also are often internal migrants, moving from rural areas to large cities for employment. Brazil’s ratification of International Labor Organization Convention (ILO) 189 on domestic workers’ rights earlier this year led to discussions about how Brazilian domestic workers could ensure the government is in compliance with the convention. Domestic workers from countries that have ratified Convention 189 say the first step is to push for creation of employer organizations so domestic workers have a collective employer with whom to negotiate contracts. Enforcement of domestic workers’ rights is difficult in Brazil because the constitution does not allow authorities to “inspect” private homes, a challenge Argentine domestic workers say they have addressed by sending out mobile vans in neighborhoods where they find employers with domestic workers. From the vans, union staff and labor ministry representatives discuss with employers how to formalize workers and have paperwork ready for employers and specific materials for domestic workers as well. Conference participants also took part in a Solidarity Center workshop on the upcoming International Labor Conference (ILC), where representatives from labor, employers and governments will negotiate a draft convention addressing gender-based violence at work. Five domestic workers from Latin America will attend the May 28–June 8 ILC, all of whom were active in the international campaign for passage of Convention 189 in 2011. Domestic workers in the Africa, Asia and European regions held regional conferences earlier this year. More photos can be viewed in the collection of 2018 IDWF Congress.